People living in streets called Acacia Avenue tend to be happy with life, rarely divorce and have kept the same job for 11 years, a survey has found. 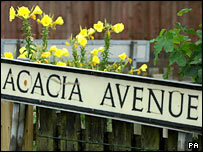 A study of 15 Acacia Avenues in England and Wales saw hundreds of people interviewed by an insurance firm. The road name has become a byword for suburban life after use in sitcoms, films, song titles and cartoons. The AA Insurance survey also found the favourite meal of 40% of Acacia Avenue residents was fish and chips. The company said it interviewed Acacia Avenue residents in an attempt to better understand its average customers. 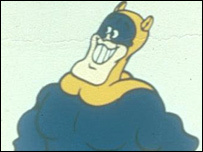 Acacia Road may have been home to comic hero Bananaman and his alter-ego Eric Wimp but Acacia Avenue was used by comedian Harry Worth as the home of his character in 1960s sitcom Here's Harry. Iron Maiden recorded a song called 22 Acacia Avenue while the 1945 film 29 Acacia Avenue featured a group of young people having a good time in suburbia when their parents returned unexpectedly from holiday. The survey found Acacia Avenue workers earned around the national average wage of £22,500 and took 21 minutes to get to work. Most houses had three bedrooms and a garden, while one in five had a shed and almost 10% had a garden gnome. Residents tended to be families and older couples and just over half went abroad for one week a year, with Spain the most popular destination. The Acacia Avenues surveyed were in Bury St Edmunds, Cheadle Hulme, Colchester, Eastcote, Hale, Hove, Kirkby-in-Ashfield, Knutsford, Liverpool, Peterborough, Port Talbot, Shepperton, Spalding, Verwood and Worthing.